Saturday 19th May 2018. A day that has been mentioned by everyone from news outlets to celebrities to family and friends! In case you haven’t heard of that date yet, that is the day of the Royal Wedding! The day where Prince Harry and Meghan Markle will get married at Windsor Castle, in St. George’s Chapel! Their wedding service will begin at midday and this will be followed by the couple traveling around Windsor in a horse-drawn carriage! You will be able to view the entirety of the Royal Wedding from the BBC, Sky News and ITV, which will also be covered by well-known presenters. You can guarantee that everything will be beautiful; dresses, suits, venue and even bouquets and flowers! Bouquets and flowers have become a huge part of weddings, the first noted use was back in ancient times when the bride would carry the bouquet or wear flower garlands to signify new beginnings. Victorian times was all about sending different flowers as a way of expressing their love to one and other. In one way or another, bouquets are a wedding tradition! Often specially made, bouquets are mainly used for weddings and anniversaries by an individual who specially picks the right flowers for you. Alternatively, you can decide what flowers you would like too! The only downside to this is that the bouquet would last around a month depending on how well they’re kept. Have no worries though, as we have the solution for you! Do you know who Endura Roses are? “Preserved Roses That Last Forever” is what they stand for and it’s their vision to provide the customers with exclusive and unique roses and flower arrangements! They don’t just do singular roses though, their preserved flowers range from bouquets to accessories to home style features! One of their most popular products is the Timeless Bouquet. “The Preserved Bouquet of your Dreams”. The Timeless Bouquet is a perfect way to celebrate the Royal Wedding! From three to six central roses that are accompanied with greenery that constantly looks fresh, this is the preserved masterpiece! With eleven beautiful colours ranging from Vermilion Red to Pure White, there is something for everyone. With there being something for everyone, it is also important to mention that Endura Roses specializes in weddings! 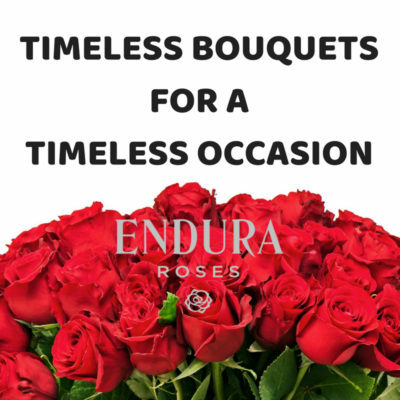 Endura Roses flowers are eternal perfection, as they truly are “Love That Lasts A Lifetime”. Not only are they perfectly preserved, but they are made with love and care from their experienced team who not only has a passion for the business but also has a passion for the beauty of nature! Endura Rose’s main goal is to not only capture perfection but to source perfect flowers from all over the world and preserve them in all their beauty. Did you know that Endura Roses have recently been involved in a TV star’s wedding? That TV star is Hollyoaks actress Sarah Jayne Dunn! The wedding was filled with timeless roses ranging from the bouquet to the floral dog collar! Endura Roses designed and styled everything! Not only did the flowers look beautiful, but it also meant that they would last and last, just like the love between Sarah and her husband! On top of this, their wedding was featured in the latest OK! Magazine. In the magazine, Sarah received double page spreads and she even thanked Endura Roses. The article states: “Sarah and Jon would like to thank… …Gayle Beckett at Endura Roses for the floral arrangements”. You can view the OK! Magazine article here! Overall, Endura has made quite a name for themselves in the world of preserved roses and natural beauty! Why not check out the preserved perfection for yourself by visiting Endura’s website today! We hope you enjoy the Royal Wedding as much as we do!